Creating a legacy and providing opportunity. 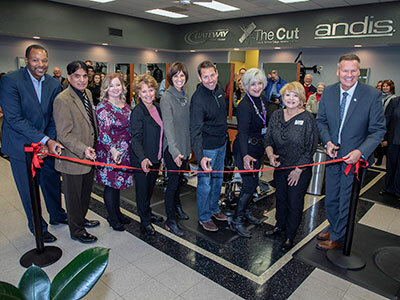 Those were the two themes which resonated among speakers at the Nov. 12 grand opening ceremony of Gateway Technical College’s new Cosmetology and Barbering studio, The Cut Powered by Andis, 425 Milwaukee Ave., Burlington. Bryan Albrecht, Gateway Technical College president and CEO, said the opening of the studio is an illustration of how the college is invested in the Burlington community. The programs have been offered at the college’s Racine Campus and Kenosha Campus in the past. This fall, they were expanded west to Burlington to meet the needs of business owners seeking trained workers, as well as students who live in that area seeking to enter the barbering or cosmetology career fields. The expansion was made possible through the generosity of the Andis Corporation and the Andis Foundation. “Helping students to enter their careers, helping them to build their families and looking forward to the next generation of what they want to create in their lives – that’s the most important thing to us,” Andis Corporation President Matt K. Andis told the audience. Students will receive classroom training at college’s Burlington Center. They will apply those skills and gain hands-on experience at The Cut by providing actual services to the public, as they do now in Racine and Kenosha. Albrecht said the effort also means more than just providing training to students and barbering and cosmetology services to the community. “We will partner with non-profit organizations such as Love Inc. to make sure we are engaged in, and support, our community in many ways beyond just the services we will provide here,” said Albrecht. The studio was formerly a salon, so the space was ideal to provide a clinical salon area as part of the program expansion into Burlington. A grant by the Wisconsin Technical College System helped make the expansion a reality by through covering some new equipment and related instructor and staff costs.